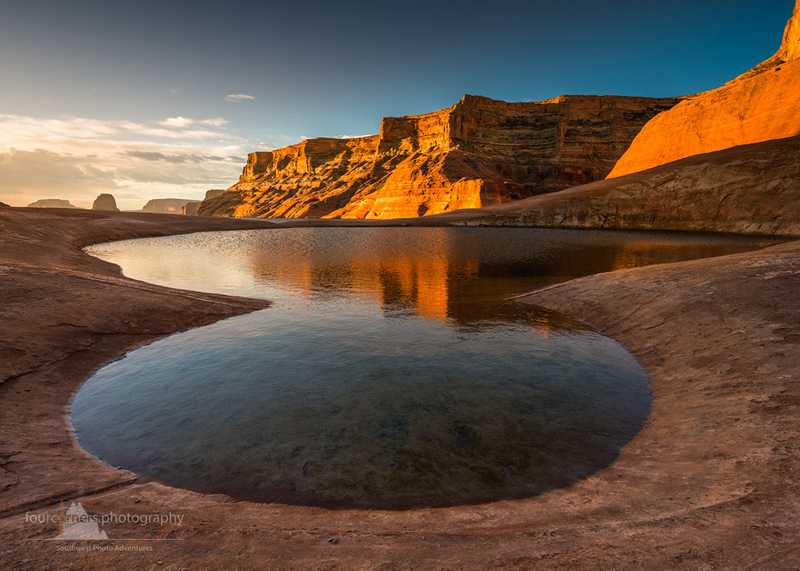 Join Kent Winchester and me October 23 – 27, 2019 for a five day Lake Powell Photography Workshop. This an unique adventure for photographers with a background in landscape photography or desire to learn it. We’ll cruise on a luxury 53 foot houseboat and take along a powerboat for access to more remote sites. 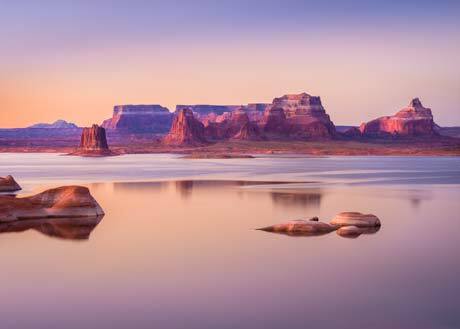 We’ll also take short day hikes inland to reach even more photographic opportunities in the high desert of the Colorado Plateau. It will be an opportunity to create wonderful photographs and improve your photography. By joining this adventure you will be able to photograph, depending on the lake’s water level and weather conditions, the Anasazi Canyon, Cathedral Canyon, Cathedral in the Desert, Confluence Canyon, Cottonwood Canyon, Dominguez Butte, Escalante Canyon, Face Canyon, Gregory Butte, Gunsight Butte and Canyon, Labyrinth Canyon, Last Chance Canyon, Padre Bay with Cookie Jar & Weathering Pit Ridge, Rock Creek Canyon, Reflection Canyon and other sights along the way. We plan this adventure to arrive at the best spots at the best time of day. At least one night on the trip we will have a discussion about photographing the night sky. The milky way will be shining in the west and the moon will be in a perfect phase to allow us dark skies until early mornings which will feature a crescent moon before sunrise. 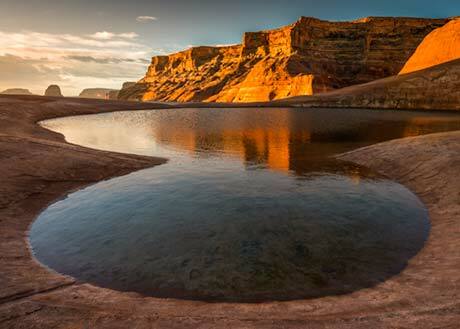 There are no guarantees, of course, but the weather is usually fine at Lake Powell in autumn. The 53 foot houseboat accommodates up to 12 people, but there will be only 8 people, including Kent and myself as the captain and photography hosts. The boat has two staterooms, two semi-private lower berth rooms, each with a double bed, two bathrooms, a living room/dining area/kitchen and a large upper deck with smaller decks front and aft on the lower level. We will dock each evening on land and you can pitch a tent on shore if you wish. The kitchen is fully equipped and has cookware, plates, utensils, glassware, coffee maker, blender, toaster, two small refrigerators and a grill. We will provide a continental breakfast each morning, but will not have a cook on board, so every one will have to arrange for their own groceries and cook for his/her own meals. We’ll send some suggested menus to participants. You should stop at Safeway in Page before embarking so you can purchase groceries and drinks. The expenses per person for this adventure is US$ 1,950. For couples, larger group (three or more participants signing up together) and alumni to previous houseboat or other photography tours with me will receive a discount. Staterooms and the semi-private lower berth rooms will be given preferentially to couples or on a first come first serve basis. Your payment includes the houseboat, the gas to move the boat, the powerboat, and our navigational and photographic expertise. We will have evening discussions on photographic topics. The expenses include a continental breakfast. All other beverages and meals are not included in the costs. You will have to arrange for these on your own, prior to the trip and you can buy snacks and drinks during the trip at Dangling Rope Marina. We will stop there twice to fill up our gas tank. Fifty percent of the Lake Powell Photography Workshop is to be paid in advance. The remaining 50% is due 30 days before the trip. Payments may be made with Visa, MasterCard or American Express. Upon payment of your deposit, we will send you an information package including suggestions for photography and travel gear, and clothing. No refunds will be given for unused portions of this adventure. We highly recommend travel insurance which is inexpensive and easy to acquire. Knowing you have 100% trip cancellation coverage makes a big difference should you have to cancel for some unforeseen reason. There are only four out of six spots left. Hurry to secure your place on the houseboat … and join us in this photographic adventure. 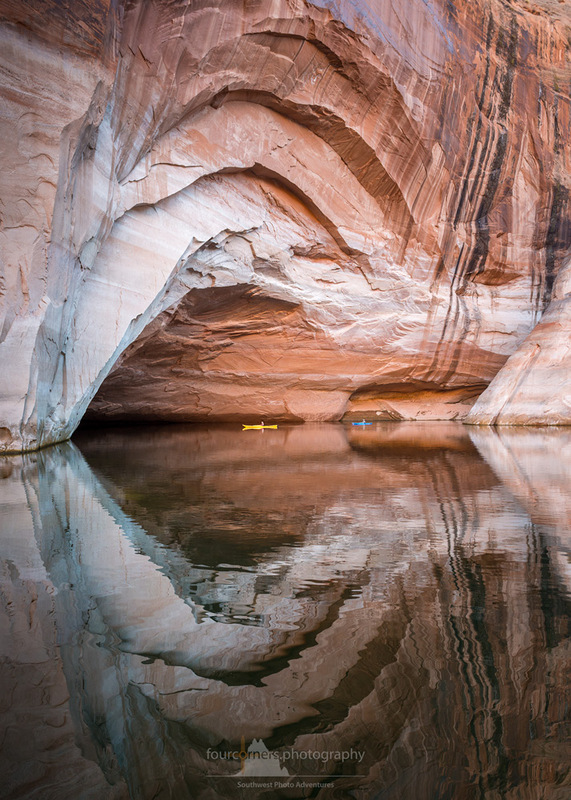 All previous years I had a special 2 days add-on extension to the Lake Powell Tour. We explored during these additional days White Pocket and/or South Coyote Buttes. This year I would like to provide something very different. Have you ever heard of the Hunt’s Mesa at Monument Valley? From up there you will have an unspoiled look over the entire Monument Valley. 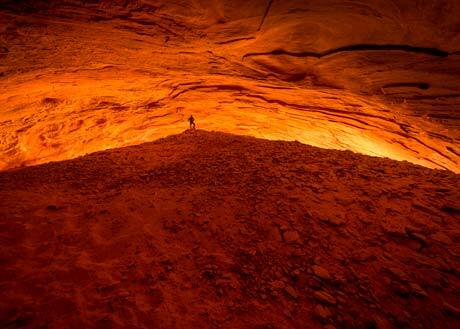 The place is completely off-road and can only be accessed with a Navajo guide. 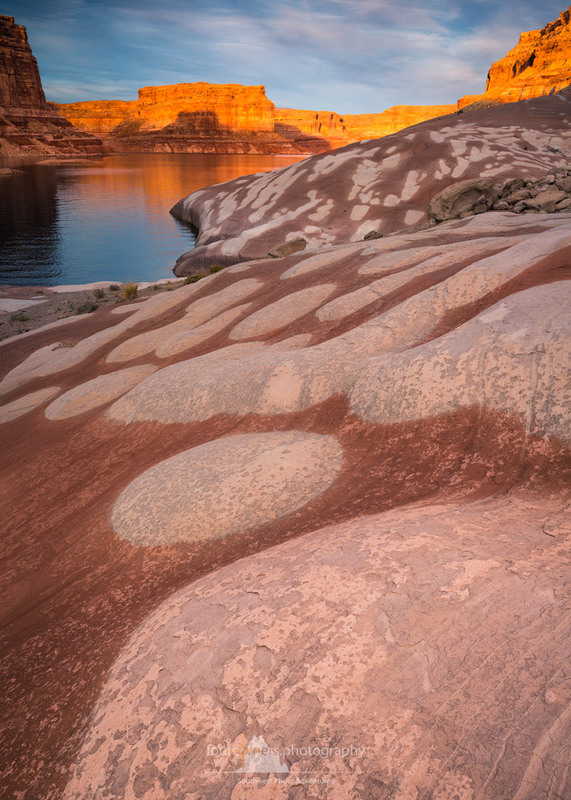 Join me for a late afternoon and an early morning photography session up at Hunt’s Mesa. For more details you can look at Hunt’s Mesa Workshop. 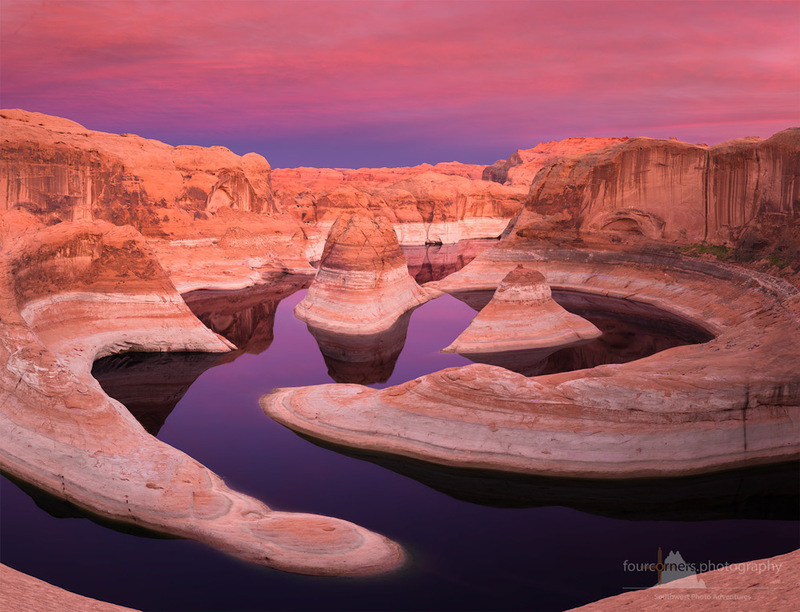 Questions about the Lake Powell Photography Workshop? Contact me.